Scottish Greens have lodged a complaint with the Advertising Standards Authority (ASA) after Donald Trump placed adverts in two newspapers linking windfarms with the release of the Lockerbie bomber. The tycoon who is fighting the proposed construction of a windfarm near his golf course on the Aberdeenshire coast, placed full page adverts in two leading Scottish newspapers last week - the Courier and the Press and Journal. 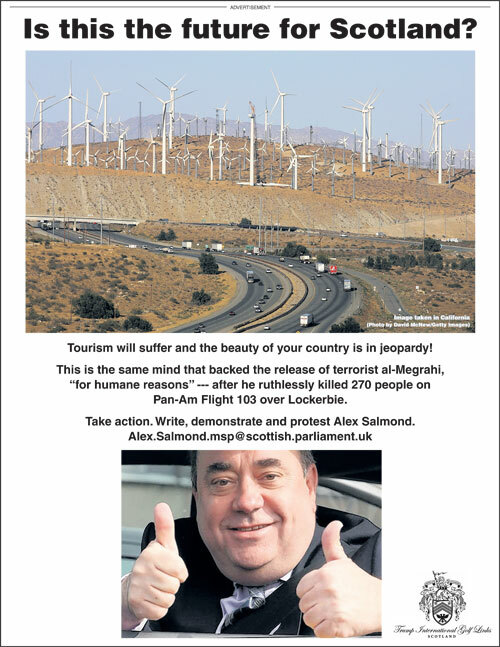 The adverts feature a photograph of First Minister Alex Salmond and a Californian wind farm, and state that "tourism will suffer" as well as linking this claim to the decision to release the Lockerbie bomber. Complaints about an earlier advert were upheld, with Trump warned by the ASA "not to exaggerate the number of turbines likely to be installed or the possible consequences of the Scottish Government's plans to use wind turbines." "Trump has sunk to a new low. Linking renewables policy to Lockerbie victims is sick. "Not only did he have no shred of evidence that tourism would suffer when we quizzed him during the parliament's inquiry into renewables, he has already been censured by the authorities for placing similar anti-renewables adverts. "Trump's organisation has already trashed a unique environment on the coast of Aberdeenshire and trampled on the rights of local people. Now he appears to be determined to buy up chunks of the Scottish press. It's vital that Scotland doesn't allow a bully to think he can flash his cash and get his own way." The Trump Organisation responded by labelling the Green Party "a complete joke" and insisting that it had wanted the advert, which has been approved by the Committee of Advertising Practice to be much stronger. The Trump Organisation's executive vice-president and counsel George A. Sorial added: "The Green Party's policies should be challenged on every front because they have done nothing to protect the deliberate mutilation of their own environment, coastline and countryside. Members of "green" groups must be embarrassed. "Those who lost a family member or a friend in the Lockerbie tragedy must be incredibly incensed with Alex Salmond for releasing a murderous criminal." Trump's latest confrontation with environmental campaigners comes just a week since his bitter spat with Lord Sugar after the American billionaire derided the UK Government for its expansion of wind farms in Scotland.